We are glad to give notice of the release of the book “Thinking and the I: Hegel and the Critique of Kant” by Alfredo Ferrarin (Northwestern University Press, 2019). What is the relation between thinking and the I that thinks? And what is the relation between thought and reality? The ordinary view shared by modern philosophers from Descartes to Kant, as well as by common sense, is that there is only thought when someone thinks something, and thoughts and concepts are mental acts that refer to objects outside us. 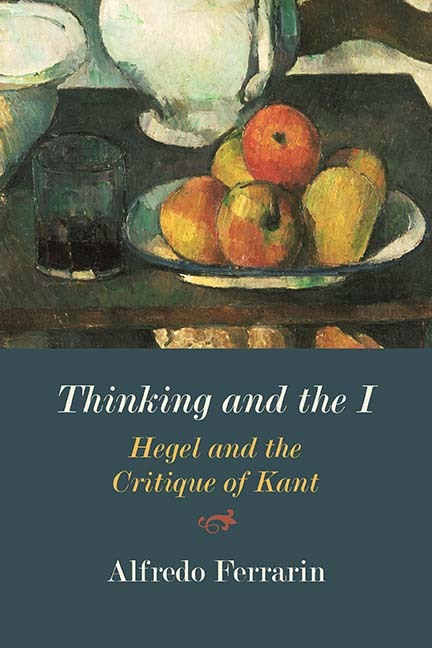 In Thinking and the I: Hegel and the Critique of Kant, Alfredo Ferrarin shows that Hegel’s philosophy entails a radical criticism of this ordinary conception of thinking. Breaking with the habitual presuppositions of both modern philosophy and common sense, Ferrarin explains that thought, negation, truth, reflection, and dialectic for Hegel are not properties of an I and cannot be reduced to the subjective activity of a self-conscious subject. Rather, he elucidates, thought is objective for Hegel in different senses. Reality as a whole is animated by a movement of thought and an unconscious logic as a spontaneity that reifies itself in determinate forms. Ferrarin concludes the book with a comprehensive comparison of Hegel’s and Kant’s concepts of reason. While it mainly focuses on Hegel’s Phenomenology, Science of Logic, and Encyclopaedia, this ambitious book covers all aspects of Hegel’s philosophy. Its originality and strength lie in its recovery of the original core of Hegel’s dialectic over and above its currently predominant transcendental, neopragmatist, or realist appropriations. It will be essential reading for all students of Hegel, Kant, and German idealism in general for years to come. For further information, please visit Northwestern University Press’ website.